Half whiteboard, half ultra HD display. The SMART Kapp iQ Pro provides you and your teams even more ways to share your ideas with SMART Meeting Pro software, using all the great features and functionality provided the SMART kapp iQ board. Need to tackle your challenges and brainstorm? Use the blank canvas of the whiteboard. Need to present, review and share? Share your laptop in stunning Ultra HD resolution on the kapp iQ Pro. Contribute from anywhere and share your notes with 250 people in real-time, worldwide. 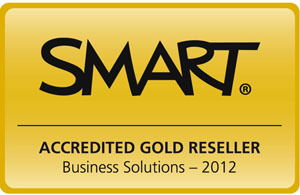 The SMART kapp iQ Pro doesn’t let down the experienced SMART users either. 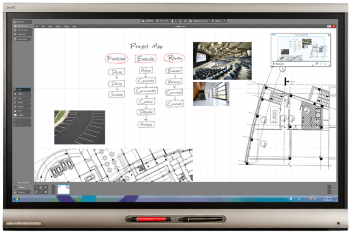 Using all the SMART technologies, such as Silktouch, Pen ID and Object awareness, the board responds in a way that you have come to expect and enables the most simple and intuitive collaboration available in the meeting room today. VideoCentric are certified in Sales, Technical and Installation and specialise in integration with Video Conferencing and telepresence, multiway collaboration and development of interactive solutions for the industry. 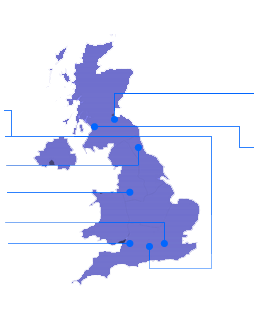 We have a portfolio of 12 certified trainers located across the UK, and can provide certified SMART training for your users, administrators and trainers – speak to us today to arrange a visit and demonstration of the world’s most collaborative interactive technologies.